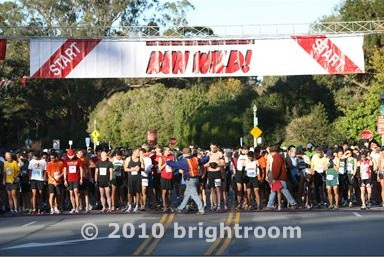 On November 28, 2010, I ran the Run Wild For A Child 5K in Golden Gate Park. I have to be really honest with you, however. I really did not want to run it. I hadn’t run very much leading up to the race. I was tired, stressed out and I knew I had no chance of performing very well. Maya had decided before coming back stateside that she would also run, so I was hoping that both of us would be able to inspire each other. Come race morning, everything went wrong. I am so not even exaggerating. I woke up and wanted to have a breakfast of peanut butter and banana toast. You know. Typical. I was out of bread. No toast for me. I was a little late getting out of my apartment and about half a block away from the bus stop, I heard that all too familiar MUNI hiss…..I bolted towards the corner and was about to see my bus pull away. I ran and the driver waited for me. Unfortunately, I had no money on my Clipper Card, so I needed to pay with cash. I put in a dollar bill, followed by 90 cents. As I was putting in my last dime, I dropped it and it rolled down the stairs and out of the door. I apologized and ran out to get it (I didn’t have another) and then hopped back up onto the bus. The driver was not amused by my bad morning…he was mighty pissed that I had held his route up. People on the bus were staring at me. I felt silly. To make myself feel better, I decided I wanted to listen to some music. I whipped out my headphones….just to find out that my iPhone had been wiped of all music. What? Argh. I had updated my phone’s OS before leaving the house. My RunKeeper application hadn’t been working well and so I decided to update the software to see if it helped. It apparently erased all of my music in the process. I was mega bummed. Running with no tunes? Lame-o. When I got to Golden Gate Park I was able to locate Maya and Eric fairly easily. We sort of stood around, discussing how poorly we were about to do. So much for motivating each other, right? Haha. I also spent a great deal of time whining about how cold it was. I had a thin, worn out hoodie on for the commute over, but since it wasn’t made of a wicking material, I didn’t really want to run with it on. I was freezing with the hoodie on, but I was REALLY cold once I took it off. Thank goodness running warms a person up! We made a stop at the port-o-potties, then it was time to line up. See all of those people in the shorts? It was in the 40s. I think they were crazy. The race started off okay. Maya and I ran together for the first mile or so. Somewhere at around 1/4 mile in we passed a camera. I hoped that it might wind up being a good picture of us, but alas, it was not. However, it was the best picture I managed to take for the entire race. How sad is that? As I said, we only ran together for about a mile. Then Maya took off to see if she might be capable of attaining a PR. I kept going at the same pace. I was already starting to struggle. I was dying to walk. I decided to make a deal with myself that I could walk once I hit the water station halfway through. I walked through the water station and a little while afterwards, then I started running again. Unfortunately, I wound up taking another THREE walking breaks during the second half of the race. I felt really lousy about it too. I mean, I had run two other 5Ks and I hadn’t needed to walk at all during either of them. During that second half, I was feeling pretty wimpy. I was also having a bit of a difficult time breathing. In addition, I was looking really fugly. 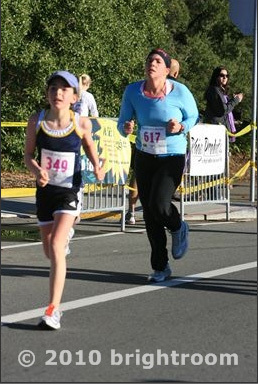 Seriously, do people ever take good race photos? The really sad part is that these pictures, in which I look like I’m dying, look 1,000,000 times better than the photos Maya’s boyfriend Eric took of me coming across the finish line. I am completely relieved that Maya has not posted any of them on the internet. So like, really, Maya, please don’t…. I ended up finishing in 32:44; Maya finished in 30:06. Neither of us were very impressed with our times, once we found them out. We waited around for about an hour, hoping to get a glimpse of our official times. We watched the costume contest to keep ourselves busy. When the results were finally posted, we were bummed out—they were all wrong. About a minute or so off. So despite the waiting, we wouldn’t know the above official results until they were posted later in the day. 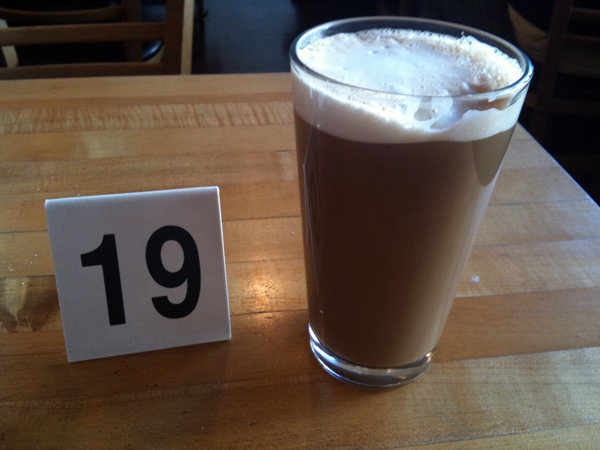 After getting our fake times, the three of us walked back down to the Lower Haight and ate breakfast at The Grind. As usual, the food was delicious. And huge. 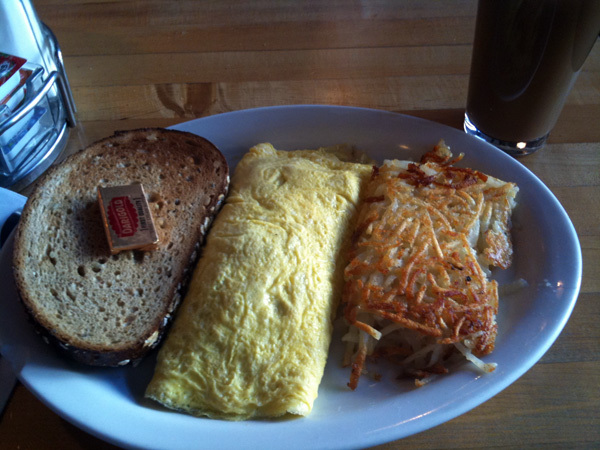 I had an omelet with wheat toast and hash browns. Maya and I shared food a bit. 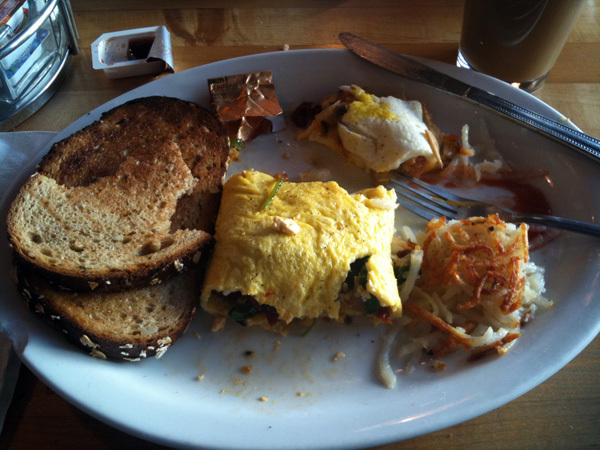 I gave her a hunk of my omelet, she gave me a hunk of hers, I gave her half of my hash browns and she shared some of her fruit. This was mid meal. I won’t lie. I ate it all. I was hungry! After breakfast, we split off. Maya and Eric were picked up by Maya’s mom, whereas I walked home to take a pre-work shower. I was pretty irritated with my time for this race. Despite all four of my walking breaks, my horrible morning, the cold weather and all of my whining, I only missed PRing by 9 seconds. It was a hard pill for me to swallow. To know that if I had only sucked it up and ran through one of those walking breaks, I would’ve PR’d kind of sucked. I know, I know. I shouldn’t look at it like that. I should be happy that I did so well given how lousy I felt. Now that I’ve got you all caught up with my last race, I’ll look ahead at my next one, which is the Christmas Classic 5K tomorrow morning. I haven’t run (aside from one or two treadmill workouts) since the last race, so once again, I don’t have high hopes. Although I was talking about potentially skipping the race due to the weather, I think I’ll probably run. My headache and sore throat has turned into a full head cold and I’ve had sinus pressure all day today. Also sneezing and a unproductive cough. All that being said, I paid for the darned race, and I’m going to race it as long as the cold is above the neck, which it is. Here’s to hoping it doesn’t rain too hard tomorrow morning! 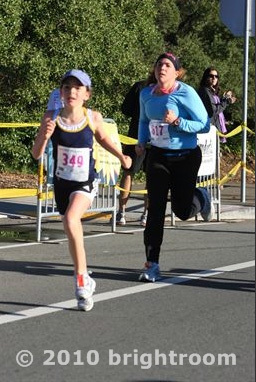 Have you ever taken a decent race photo? If so, what was your secret to achieving this? 1. Hey, I wore shorts that morning! I get warm running … but at least I had a long-sleeve top on unlike some of those weirdos at the starting line! 2. No. No one EVER takes good race photos, so please don’t think you’re pictures are abnormal. 🙂 There are no such hints anyone can give about taking good photos that actually work either. ALL RACE PHOTOS ARE BAD! And congrats on the race, anyhow! I think you did great! 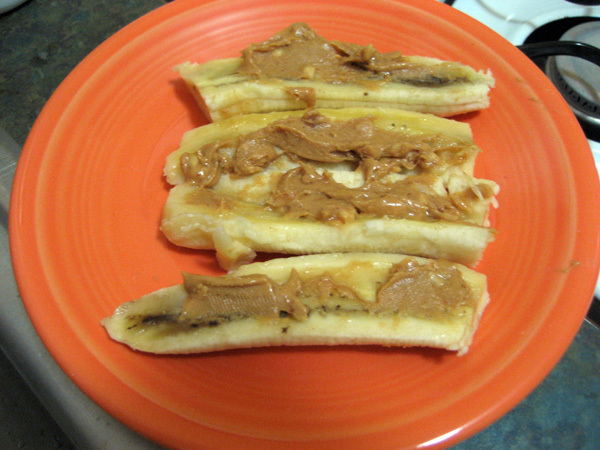 Gotta love the PB+banana combo… And cafe au lait as a post-run fuel, hahahaha. It was fun. Even if we didn’t run together for most of the time, it was nice to have someone to talk to before and after the race. I’m usually all by my lonesome, and I think I am missing out on something there. 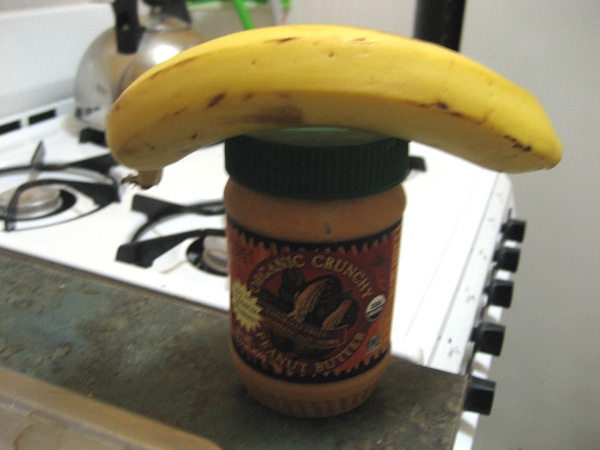 I eat exactly the same thing before a race: for a 5K 1/2 a banana with 2 tsp PB. For 10K and more, a full banana with PB. If I eat more than that, my stomach decides it won’t race. Bad stomach! As for race picks – you are SO right! In my pics, the people in there with me look good but I always look like crap. Not fair. I so wanted a photo of some key races this past year but they turned out so crappy, there was no way I’d buy them. Oh well… I’ll hire my own photog. for the next big one.